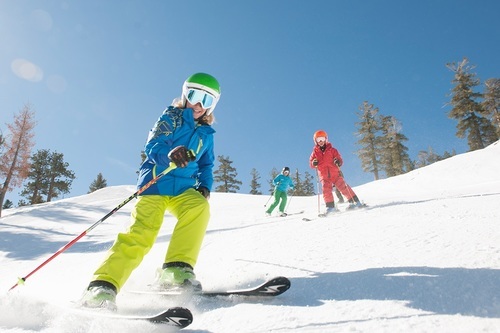 Planning your first ski holiday with children can be a daunting prospect. Even if you are an experienced skier there are so many things to consider when taking young children skiing for the first time. However, don't let the planning process put you off organising a fabulous family holiday. After all skiing is a skill that once mastered will never be forgotten (it's a bit like riding a bicycle) and you will be amazed at how quickly your children pick it up. Of course to begin with it may be quite tough but the learning curve is steep and given the right amount of encouragement and a good ski school to help them along their way your child will be zooming around the mountain in no time at all. What is the best age to start a child skiing? Generally children can fit into a pair of ski boots when they are 3 years old and as far as we are concerned this would be a good time to start. Three and four year olds generally start in what is loosely termed a "ski kindergarten". This is a safe roped off area, usually at the bottom of the slopes, where very young children can get used to having skis on their feet. They might also get to experience descending a very gentle slope to enjoy their first skiing thrills. In better equipped kindergartens there is a ‘travelator’ so children don’t have to walk uphill. The lessons in the Kindergarten are usually for 2 hours per day and are supervised by qualified instructors. Alpine Answers tip: We recommend where possible travelling with friends, siblings or relatives so your children can feel comfortable doing something new with familiar faces around them. Try to avoid booking accommodation that is a long walk to the ski school meeting point as trying to get children organised for a day on the slopes is not a quick exercise. The closer you are the easier your life will be first thing in the morning. If you have to do some walking make sure you can leave all the equipment in a ski hire shop near the lifts and ski school meeting point or go with an operator that offers a shuttle service, although unless this is a dedicated driver just for you it will not offer a 100% guarantee of things running smoothly. We suggest that if you are travelling with young children that you book accommodation near the ski school meeting point as a priority. To begin with we would recommend group lessons over private lessons as little ones enjoy being around their friends, sharing the same experiences and excitement. There are now many British run ski schools in most known resorts which do an excellent job teaching and encouraging British children to enjoy the mountains and how to ski. They make the lessons fun and the kids pick things up very quickly. When your child gets to the point where they have grown out of following an instructor with other kids it’s time to consider looking at private lessons. This will take them to the next level and in time they can learn to ski off-piste, or specialise in one of the race disciplines such as slalom or giant slalom. When should you consider one of the local schools over a British ski school? In some resorts the British ski schools do not have access to the ski kindergarten areas which we think is important, especially for young first time skiers. If this is the case we would strongly recommend the local ski school over a British one. The local ski school will have the access to the "Magic carpet", the safer roped off area for the lessons to take place, as well as the infrastructure to deal with bad weather, cold children and the call of nature. Once children are able to ski, take lifts and ski on the mountain in safety they can then use either ski school. Alpine Answers tip: If you are taking your children skiing during one of the peak weeks of the season book ski lessons at the earliest possible opportunity as there is always a huge demand for places. In fact it is best to check that your preferred ski school has available lessons before you book your holiday accommodation and travel. There is no point booking your holiday only to find that you cannot find a place in the ski school. What to do once the children have finished skiing for the day? In Austria four hours of ski school tuition with a supervised lunch break in the middle (you pay extra for food) is often the norm. This means the skiing day lasts from 10.00hrs to 15.30hrs each day of the week (except for the normal changeover day - Saturday). In Italy and France lessons often last 2.5 to 3 hours in the morning and finish before lunch although some schools do also offer afternoon lessons as well. We recommend that younger first time skiers (aged five or under) take half-day lessons as they will not be strong enough to last all day. At this point the larger and more established ski schools can often step in with afternoon childcare. The best have invested considerable time and money into this, and sometimes offer purpose-built indoor nurseries and restaurants. Many of our clients like to book a holiday with a British tour operator specialising in family skiing holidays. These packages come with English-speaking childcare provided which is either in-house, or located in another chalet or hotel nearby. The service will include your children being taken to ski school for you, brought back again afterwards, provided with lunch, and then entertained in the afternoon with games and excursions laid on by specialist staff. The supervision often stretches from 09.00hrs to 17.00hrs with the option of evening clubs too. There is no doubt that watching your child, or children, learning to ski is a very rewarding experience. Although this experience comes at a price we feel it is worth every penny, especially when you consider the excitement and fun your family will have. If you get the basics right your child will progress with amazing speed. Soon they will be whizzing past you on the slopes, so be warned! Alpine Answers has been selling family ski holidays since 1992. Please do ask us for advice and help. We would love to get your family on the slopes for your first ski holiday with children.